Dr. Garland specializes in the treatment of infants and children, including cleft lip and palate repair, craniosynostosis (skull shape abnormalities), speech disorders (hypernasal speech), ear abnormalities and vascular anomalies (birth marks). She has additional training in craniofacial surgery, maxillofacial trauma and orthognathic (jaw) surgery. She also performs a wide range of adult reconstructive and cosmetic surgery. 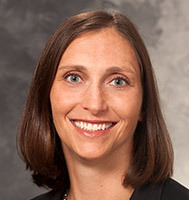 Dr. Garland’s research is focused on surgical outcomes in cleft and craniofacial patients. She is also interested in improving surgical education for students and residents.